I was never a big Goth person. Maybe it was the mindless fandom Marilyn Manson used to have, but I was always turned off to the whole scene. Sure, little bits popped up here and there. Type O Negative were able to get the spooky part down, but had enough self-awareness to not take themselves too seriously. Then there's H.I.M., but I guess they lean more towards the rock side. Maybe it's just the fact that Ville Valo can sing AND smoke a cancer stick at the same time, something no one else does these days. Finally, there's Robert Smith. Granted, I can't stand listening to anything The Cure has done, but Robert has shown that he has a wicked sense of humor outside of the band. So, I guess what I'm saying is that I like the personalities, but for the most part, the music never got a good hold on me. Except Manson, as both sides of the coin totally disgust me. 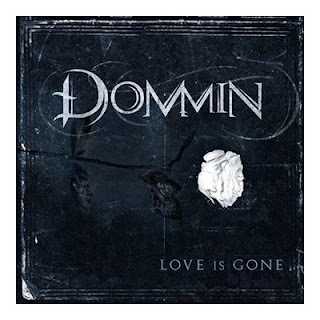 Now there's Dommin, a young bunch of goths hoping to put heir stamp on the genre with their debut cd, Love Is Gone. Upon first listen, I could tell a lot of influences right off the bat. Type O, H.I.M., but especially The Doors. In fact, track #6, "Dark Holiday", is a total homage to The Doors style, right down to the keyboard playing. Lead singer and main songwriter Kristofer Dommin knows his craft well, and can hum with the best of the goth crowd. key sound in the background that overpowered the rest of the playing. It made me wish I was the producer so I could turn down the levels on that thing. However, when the effects are atmospheric, it ends up blending so much better with the rest of the song. The final word is that Dommin has a lot of potential, but are stuck in the pattern of writing the same riff several times over. There's the possibility for a great second record with good production and matured song writing, so I can consider their first outing a stepping stone and a learning experience. I'll giving it a final ranking of "Meh"-core, but I will be giving their next record a spin to see if they have learned from their past.